Due to the fact that my predictions for the 2013 season were so successful (the Minnesota Vikings did in fact end up in last place – 1 out of 10 ain’t bad right?) I’ve decided to offer up a few predictions for the upcoming NFL season. Please, don’t try this at home. The selfies I took in my day were this much, much more…misunderstood. 1. Johnny Manziel will set a record for most selfie’s taken by a back-up quarterback in a single season. 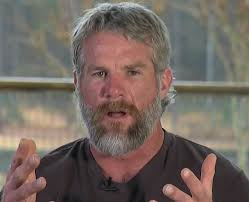 Along the same lines Brett Favre will come out of retirement and add to his record of self-taken pictures though, admittedly, of a different sort. 2. The Peyton-Manning-led Denver Broncos will collapse and miss the playoffs when the city of Omaha, for no apparent reason, changes its name to Tebow thus causing much confusion, and painful memories, for the Broncos as Manning continually shouts “Tebow” before every snap. 3. Daniel Snyder will relent to the pressure to change the name of his beloved Washington Redskins to the Washington Sleazeballs causing the Federal Government to, once again, hold hearings on why the team’s nickname is insulting – to government officials. 4. Michael Sam will become the first NFL player in history to not get excited at the prospect of being interviewed by Erin Andrews. 5. With the addition of many new faces, the Chicago Bears’ defense will return to its dominant “Monsters of the Midway” roots by tackling not one, but two, running backs over the course of the season. 6. Teddy Bridgewater will supplant Matt Cassell, who will supplant Christian Ponder, who will supplant, Donovan McNabb, who will supplant Brett Favre, who will supplant Dante Culpepper, who will supplant Warren Moon, who will supplant, Tommy Kramer, who will supplant Fran Tarkenton as the next Minnesota Vikings’ starting quarterback to be supplanted. 7. Giving into the pressure yet again, Daniel Snyder will change the name of his beloved Washington Sleazeballs to the Washington Politically Corrects leading to massive protests across the country as those who claim to be politically correct make it known that they would rather not be associated with Daniel Snyder. On a side note, former Clippers owner, Donald Sterling, issues a public statement demanding the Packers follow-suit with Daniel Snyder – nobody knows why though. 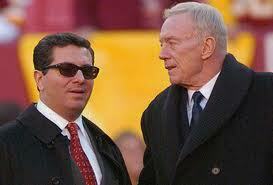 Jerry Jones attempting to talk Daniel Snyder into re-naming his team as the Washington Jerrys. Even Daniel Snyder has some standards. 8. Speaking of crazy owners, Jerry Jones, the owner of the Dallas Cowboys, will continue to be absolutely insane. 9. Super Bowl XLIX, which will be hosted in Arizona, will be won by the team that Overlord Brewer deems conservative and patriotic enough to win the big game. This team could be none other than the Arizona Cardinals, but only after they are purchased by Sheriff Joe Arpaio and Donald Sterling and renamed the Arizona White Conservative Tea Partiers. Yes, Sarah Palin, will in fact be the mascot. 10. 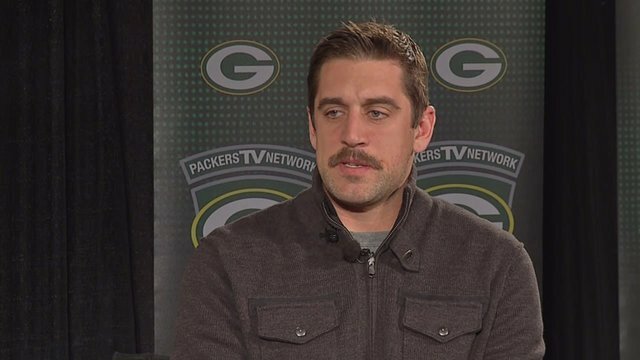 Aaron Rodgers, despite continuing to date Olivia Munn, will continue to deny the allegations that his mustache is fake. 11. Lovie Smith’s return as a head coach will result in the Tampa Bay Buccaneers leading in the league – in lost coach’s challenges. 12. After week 1 the Oakland Raiders will relocate to the Bermuda Triangle and never be heard from again. This, of course, will result in the fewest losses the team has sustained in a season in recent memory. 13. The Seattle Seahawks will return to their championship form until, in Week 12, Pete Carroll comes under investigation for various financial infractions, forcing him to slink off to become an US Senator where these sorts of activities are not only accepted but embraced. 14. After preseason’s conclusion, the league will determine that raising the crossbar five feet and pushing back the extra-point the 17 yard line hasn’t made the play any more competitive and will force kickers to run the ball into the end-zone with no blocking against the entirety of the opposing team’s defense. 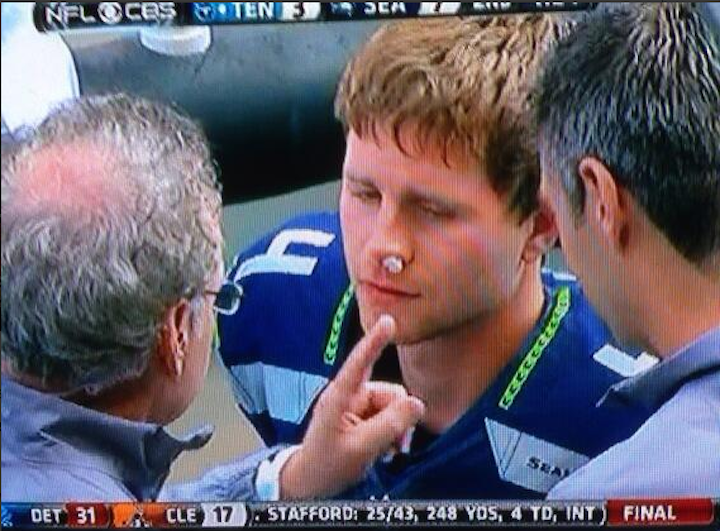 If the kicker gets in they get a point, if they don’t they will most likely need to be taken to the hospital. 15. Finally, Richie Incognito, realizing his football career is over, will become a football analyst on Fox – tell me that doesn’t make sense. Be sure to print this off so that you can tick off my predictions as they come true. Enjoy! Good news: You got us the point. Bad News: You are now like the guy from the movie Memento.